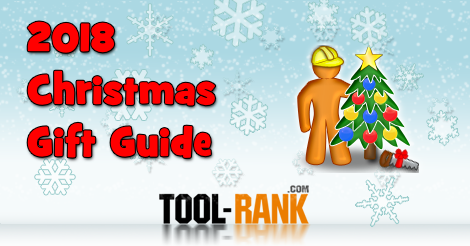 We put together a list like this every year to help you out, so if you can't find something you like on this year's list, you can always go back and look at our past Christmas Gift Tool Buyers Guides to find even more awesome tool-related gift ideas. Also, be sure to check out our Hot Deals section to see if any of these tools are on sale. Many of the items on these lists never go out of date. next to each product title will take you to a store that sells the item. The Bora QuickCut is an accessory for your circular saw that makes it easier to cut 90°, 45°, 60°, 22.5-degree angles along the 14-inch long guide. The guide can also be used as a 14-inch ruler. This is a far better circular saw guide than using a rafter square. Stanley figured that since a baseball feels pretty darn good in your hand, a baseball-shaped tape measure will also feel pretty good. They were right. The Stanley Ball Tape Measurer fits like no other tape I have used. The rounder sharp ensure I always have a good grip. Music or a good audiobook can help time fly during a boring or tedious task, but your average headphones aren't going to do you any good when there is a loud piece of equipment roaring in the background. WorkTunes helps to block out harmful noises while offering Bluetooth connectivity that allows users to listen to the favorite music from their smartphone. We reviewed this torch last year, but it didn't make it to our list in time; so we decided to add it to this years list. The TS8000 is an upgrade to the standard Bernzomatic torch. This one offers an automatic start button combined with a flow adjustment valve to deliver more control. I have been testing this sander out for a few weeks now on some projects and I really like it. It has the power of a corded random orbital sander without the hassle of a cord getting caught up on your project. We live in a world where we like things to be straight and level. So when I am on the job I turn to a Bosch Line Laser to make sure everything is where it needs to be. The Bosch GLL 2 delivers 3/16" accuracy at 30 feet and includes a handy mounting stand. When you don't feel like wearing headphones or you just want to share your music, the DeWalt Bluetooth Speaker is a great choice. It offers Bluetooth connectivity, a radio, and a DeWalt battery charger that is compatible with 20V and 60V DeWalt batteries. It even has a USB charger, so you can keep your phone powered. The Rockler Mini Router Stand is a great alternative to a space-hogging full sized router table. It provides most of the features you would expect from a full-size table in a benchtop friendly package. You can even mount it and used it directly from a wall. Working in the shop one day and out in the field another day? Metabo HPT's new Multivolt Miter saw offers both corded and cordless connectivity. This is the perfect miter saw for people that need a bit portability. I purchased this CNC router myself a few months ago and I have enjoyed programming and milling my own designs out of wood. This is a kit that contains thousands of parts, so it is not for everyone, but if you can follow a few youtube videos, it shouldn't be too difficult to assemble. A kit with everything you need will cost around $1,500.